Microsoft relaunched their search engine Bing on June 1, 2009, just over a year ago. 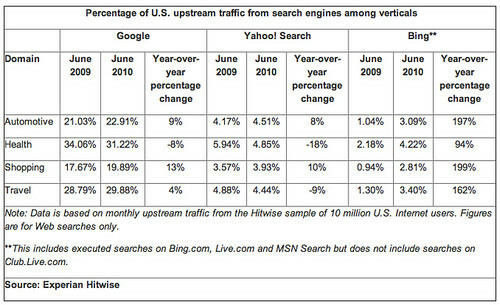 On June 1, 2009 Bing's market share, according to Hitwise was 5.25%. A year later, according to Hitwise it is 9.85% share. If you do the math, that is about 88% growth year-over-year, not too far under double growth! Of course, growing share from 5% to 10% is nice, but it still shadows Google's share. 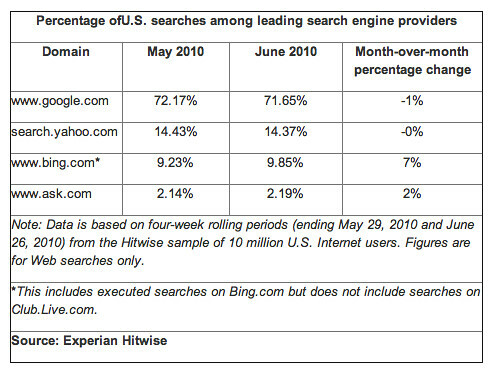 In June 2009, Google had a share of 74.04%, June 2010 Google's share is 71.65, so that is a 3% decline. Previous story: Google Invests In Major Part of Facebook via Zynga For Games Or More?